Home care assistants have one of the more personal health care roles – assisting people with the daily tasks of living, many of which we can all easily take for granted. For those who suffer from a disability however, tasks that we may see as simple and rapid can become difficult and time-consuming. For some people, such tasks will be completely impossible without outside assistance. 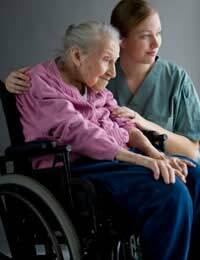 If you are the type of person who has a warm empathy and a desire to help others make the most of their abilities - while offering your physical and emotional support to help them achieve necessary daily living tasks, then a career as a home care assistant is probably your best match. You can provide a positive contribution to community social services while gaining immense job satisfaction. A home care assistant role is a varied one and most people will specialise right away, meaning that your training will be geared to a particular area of home care support. While you can enter this type of social services field with no formal education, you will be limited in your options and your salary. Those who have no formal training typically work in community cleaning and cooking roles, where they take care of the household tasks that can be too overwhelming for people such as the elderly or those with temporary disabilities or injuries. Others can take certificate or diploma courses ranging from several months to a couple of years. In these courses, you can specialise in an area such as disabilities or elderly home care. You will learn how to operate various types of equipment used for facilitating toilet use and you will also learn about diseases such as Parkinson's disease, which usually require a certain level of home care assistance for those who do remain in their home. You may work with people who have total or partial paralysis. As such, your level of care may involve assisting with all daily functioning and tasks, or just some of these tasks. This type of community social services work can have numerous challenges, but can be highly rewarding as your support is allowing a person to live to their fullest. There can be language challenges due to neurological damage and speech impairments from a person's health condition. Such challenges can make communication similar to learning an entirely new language. You may learn from a person's eye movements or you may pick up cues from specific sounds that the person makes when trying to communicate a need. Daily living is not something that comes easily for many people, and it is the home care assistants who help disabled people manage tasks ranging from basic to complex. Whether the care involves full physical responsibility such as bathing and feeding, or less involved support such as cooking and cleaning for a person with moderate arthritis or a sports injury, your work as a home care assistant will be vital in helping people to live their lives to the fullest. Given the responsibility of providing personal care, your shifts could be quite lengthy at times but you would be compensated accordingly. Pay scales are extremely varied for home care assistant work. You may work at a lower hourly wage for careers that involve only cleaning and household tasks while those providing support for disabled people, particularly where the role holds a great deal of responsibility, can make a solid, stable salary. Those individuals who are comfortable with hands-on work and have a sincerity, trustworthiness and empathy towards others will fare well in this very caring career. A certain amount of physical strength for lifting is necessary and you should have a clean bill of health from your doctor. The sooner you begin your training, the sooner you can start putting your skills into action for a career as a home care assistant. Please see National Careers link here and here. I hope this helps. @Katso - the government has put a lot of money into schemes where caring for people at home is preferential than taking them into hospital, so there are a lot more jobs around in this area, which is fortuitous for you. It would be useful if you had some experience in a caring role, but even caring for family or friends may go towards this as will volunteer roles. Many organisations are now employing people and training them on the job. According to the National Careers Service there are a number of qualifications that you can work towards, such as Level 1 Preparing to Work in Adult Social Care, Level 2 Supporting Individuals with Learning Disabilities, Level 2 Awareness of Dementia and Level 2 Diploma in Health and Social Care. But most of all a good caring assistant will need a caring, patient andfriendly nature. You would also need to pass background checks by the Disclosure and Barring Service. A good idea is to try and seek out some jobs in your area, it may mean you starting at the bottom, but if you are dedicated you would soon easily be able to advance. I hope this helps. I am interested to be a home care worker but don't have qualifications.If only you can tell me what to do and whom can i talk to.I only have a Computer Science Certificate and i need to get a chance to understand what is needed in order to get a job from you and to know what other people need and understand them.Thank you and can't wait to hear from you. You dont always have to have 3-6months training you can get training on the job like me and they also do online training. Where abouts are you and who have you spoken too there are so many out there that offer training but some prefer that you have had training. ~The company i am with are great to work for.